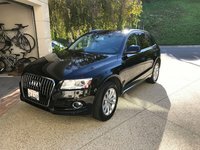 Looking for a Used Q5 Hybrid in your area? CarGurus has 19 nationwide Q5 Hybrid listings starting at $15,613. Hold on, it’s coming! Audi claims that, after an unexplained three-year delay, its 2013 Q5 Hybrid is slated to enter the U.S. market sometime this year… maybe. Promises, promises! Already running around European roadways for almost a year, this 5-passenger compact crossover ute would be the German automaker’s very first hybrid endeavor on this side of the pond and is touted to represent the flagship trim in the Q5 lineup. Should this event come to pass, look for this eco-friendly ute to offer a marginally reduced cargo capacity compared to the present gasoline-only versions… less, therefore, than an already stingy 57.3 cubic feet with the rear seats folded. This is, of course, due to the bulky battery pack common to today’s hybrids, which will, additionally, boost an already hefty curb weight of nearly 4,300 pounds noticeably higher. A number of reviews claim, however, that this added weight ought to have little effect on this baby crossover’s impressive agility and acceleration, nor will the battery intrude on the surprisingly roomy cabin area. Expect, meanwhile, that as the top trim of the line, the Q5 Hybrid should be equipped akin to the luxurious standard of its conventionally powered siblings, right down to standard Quattro all-wheel-drive (AWD) technology. Finally, some minor exterior and interior tweaks expected for the entire 2013 Q5 lineup will, naturally, be incorporated into the upcoming (hopefully) Hybrid version. For its debut, the Q5 Hybrid is expected to sport the traditional direct-injected (DI) 2.0-liter turbocharged inline 4-cylinder (I4) gasoline engine and 8-speed shiftable automatic transmission. Ordinarily, this powerplant produces 211 hp and 258 lb-ft of torque, but rumors are circulating that the 54-hp, 1.3-kilowatt electric motor will add a bit more horsepower here and a tad more torque there, allowing this hybrid to boast a combined 241 hp and 354 lb-ft of torque. That means this little beast should be able to tow some 4,400 pounds of trailer when properly equipped. The gas-to-electric power conversion is claimed, by Audi, to be accomplished via a “wet” dual-clutch system that is not only seamless, but will allow the electric motor to propel this heavy ute up to 62 mph for about a mile or so. Needless to say, the electric motor, fed by a lithium-ion battery, is more a supporting cast member than a lead actor, but in keeping with traditional hybrid technology this high-end ute does boast auto stop/start capability in city driving, as well as brake regeneration to help with battery charging. Oh, and the high-tech hybrid system with an assist from variable valve timing (VVT) is expected to keep fuel efficiency in the range of 27 to 28 mpg on average. Furthermore, a selectable three-mode drive system allows for decidedly fuel-efficient D (default) mode, an electric-motor-boosted S (sport) mode for a sportier drive and an EVA mode that stresses electric power over gas power. In EVA mode, most power is electric, with the gas engine kicking in for extra acceleration and then falling back into electric-drive mode. The Quattro AWD system, meantime, is expected to be managed by the traditional mechanical, limited-slip center differential, complemented by standard descent control. Once more, keep in mind that the Quattro system, especially in the Q5 Hybrid, is designed for wintry roads and muddy trails, not rock climbing in Baja. Should Audi’s compact crossover Hybrid trim indeed bask in North American charm and sophistication, look for such features as 19-inch alloy wheels, a power sunroof, leather upholstery and leather, alloy and genuine wood cabin bling, as well as heated power-adjustable front seats and tri-zone climate control to be standard. Additionally, power accessories, including heated power-folding exterior mirrors as well as cruise control, a universal remote garage door opener, a power-opening tailgate and Audi’s touted MMI audio, navigation and communications interface system are all expected to be standard, too. Note that the MMI system is tweaked to display power, fuel and battery information for the Q5 Hybrid’s operating systems in addition to its usual tasks. Entertainment, meanwhile, is again contemplated to be via a 505-watt premium audio system with a single-CD player, 14 speakers and iPod/iPhone interface. Lastly, Bluetooth hands-free technology, a WiFi hot-spot for limited internet access on a number of devices and a hard-drive-based navigation system (via MMI) are all expected to come standard as well. As for options in this top-shelf trim, look for upgraded and upsized wheels, unique cabin trim, roof rails, heated seats (front and rear), adaptive cruise control, running boards and Audi’s popular Drive Select Package, which tweaks engine, suspension and transmission performance for optimal driving in any road conditions. 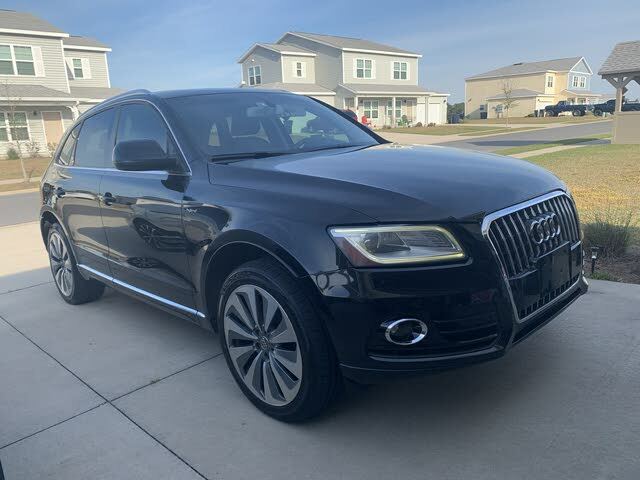 Finally, the 2013 Q5 Hybrid ought to maintain Audi’s top-notch safety ratings through such standards as 4-wheel antilock brakes (ABS), traction and stability control, front and rear head airbags, front side-mounted airbags and active front headrests. Adaptive high-intensity-discharge (HID) headlights will be complemented by new LED daytime running lights, as well as front fog/driving lights, while turn-signal-integrated mirrors will likely return, as well. Audi Side Assist blind spot warning should be standard, as should a post-collision safety system and a remote antitheft alarm. Finally, expect optional safety equipment to include rear side-mounted airbags. What's your take on the 2013 Audi Q5 Hybrid? Have you driven a 2013 Audi Q5 Hybrid?